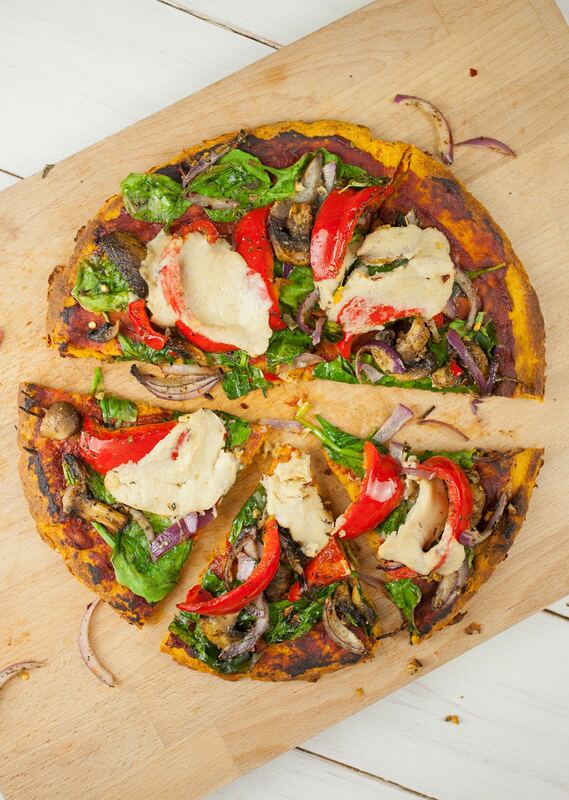 Who would have thought it would be so easy to make a sweet potato pizza crust? 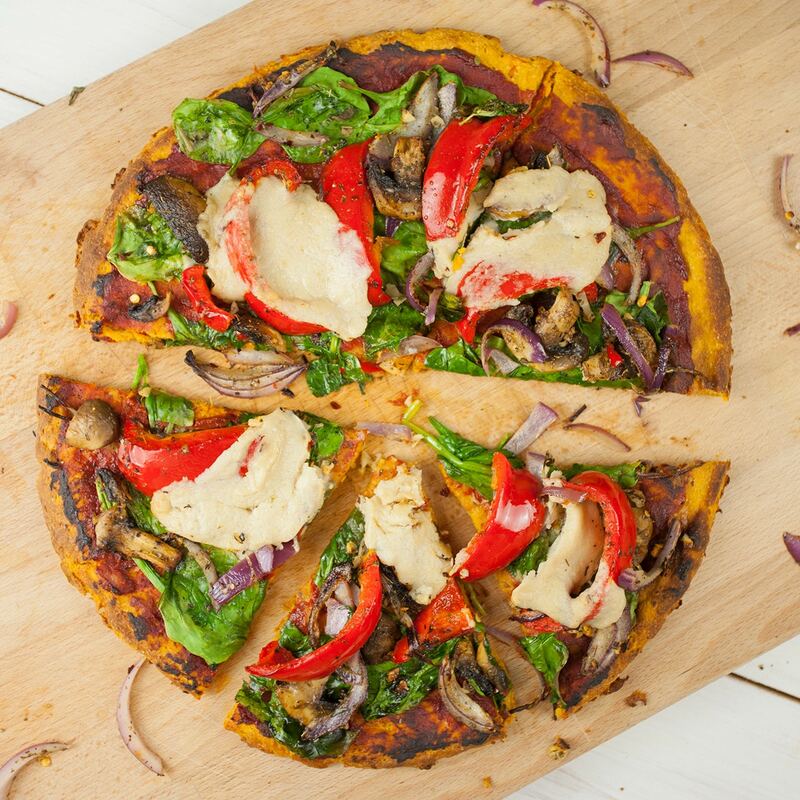 We rarely have time to make pizza dough from scratch, so this simple, healthy alternative is a very worthy alternative when you have a craving for pizza! And yep, it’s gluten free. Not bad, right? We use tomato puree for the sauce because we love the intense, tomatoy-flavour. But you can use passata sauce instead if you prefer! The vegan mozzarella we used is from Cheezly. Preheat oven to 200°C and line a large baking tray with greaseproof paper. Cook the sweet potato in a steamer for 20 minutes or boil the potato until soft. Transfer the soft sweet potato to a mixing bowl and mash. Then add oat flour and mix with a wooden spoon until well combined. Prepare a little water in a small bowl and use it to wet your hands, then shape the sweet potato dough into a ball and place it on the lined baking tray. Dipping your hands in the water will make it easier to shape the dough without it sticking to your hands. Shape the dough into a circle roughly 0.5cm thick and smooth it out around the edges. Bake the dough in the preheated oven for 15-18 minutes. Meanwhile, prepare the toppings by mixing together the onion, pepper, mushrooms, garlic, salt, pepper, italian herbs, chilli flakes and olive oil until the veggies are fully coated in the seasoning. Once the dough has finished baking, remove from the oven and spread the tomato puree on top followed by a layer of spinach. Then, start layering the veggies on the pizza. Finish with slices of vegan mozzarella, some basil leaves and a drizzle of olive oil. It is so good and tasty that I just keep doing it !!! Thank you so much for all these wonderful recipes! Apparently, I’m the only one who doesn’t know how many sweet potatoes equal 500 grams, LOL. One of my favorite breakfast foods growing up; now I can’t eat oats. What kind of flour could be substituted? I really would like to make this. Thanks. I made this last night and it was incredible!! I used gluten free flour from Costco and it worked well. I also let it cook in the oven a little longer. The best gluten free crust yet and finally one that has some density and isn’t super thin. I plan to make this once a week! Thank you. Hey Em. We wouldn’t recommend freezing the pizza because the consistency might change. But you can pre-make the dough and leave it in the fridge overnight. Do you think it will work with rice flour instead? Yep absolutely. Let us know how it goes! Hi! Many Thanks for the recipe , just a question, how many aprox. calories provide a portion of this pizza? Would love to try. Is it ok for someone with high cholesterol? Can you white potato be used as well? Certain types of sauces or topping may mix better so I”m just curious. BTW, steaming potatoes is the healthiest way to cook them. do you think it would work to make the rounds smaller for either individual pizzas or for dinner crackers? Do you happen to have the nutritional info for the crust? Absolutely delicious! Thank you so much. I love the simplicity of the crust too! Love this pizza would it be ok to prepare the base in advance? Pre bake, cool and refrigerate up to 24 hours? Ready to prepare toppings the following day. What is the carb count for the crust?